As with most kid's flicks, this one was made knowing it would be do more business on video than in the theaters, so little will be lost to the small screen. The thing I've always liked best about Muppet movies is all the pop culture sight gags that send adults laughing over the backs of their chairs while the kids sitting next to them just giggle at the Muppets because they're the Muppets. "Muppets From Space" has more of these over- the- heads- of- babes gags than any of its predecessors, and while the story -- about hook-nosed, species-unknown Gonzo searching the stars for his origins -- only moves forward in clumsy fits and starts, when the plot stalls out, the gaps are filled with funny, funny stuff. After opening credits accompanied by a laughably ominous space opera score, the story begins with a dream sequence in which Gonzo is turned away from Noah's Ark because there's only one of him. As the rain starts pouring down, Noah (F. Murray Abraham in a cameo) hands him a small umbrella and wishes him luck. Gonzo wakes up and the movie starts in earnest when his alphabet breakfast cereal suddenly spells out a message from his extraterrestrial brethren. Of course, Kermit, Piggy, Rizzo the Rat and the rest of the gang think he's nuts. So Gonzo feels outcast. He sighs heavily and stares at the stars. He mows "I AM HERE" in his lawn, hoping it will be spotted from space. He is interviewed and dismissed on a public access UFO show by Miss Piggy as a ruthlessly ambitious amateur journalist, reminiscent of saccharine-sweet and deadly Nicole Kidman in "To Die For." But there is one person who does believe he's from outer space -- the invasion-paranoid head of a covert government operation (Jeffrey Tambor) trying obsessively and overzealously to prove that aliens, any aliens he can find, threaten national security. When he gets his hands on Gonzo, it's up to the Muppets to save him. 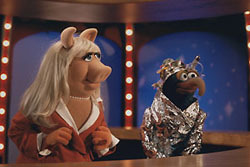 Sci-fi spoofs are, of course, everywhere in "Muppets From Space." When a Cult of Gonzo springs up, one of the members makes a mashed potato bust of the beaked freak, a la "Close Encounters," and more recent genre giants like "Independence Day" get pies in the face as well. Prison movie jokes get plenty of play, too, when Rizzo (Gonzo's best friend) gets captured by the baddies and used in lab experiments. The lab cage tough guy exercises by using mousetraps for bench-pressing and Rizzo escapes through a hole in his cage hidden behind of poster of the "Mice Girls" (think "The Shawshank Redemption"). Constant little laughs like that and a parade of hilarious cameos (Piggy seduces a security guard played with hammy aplomb by Ray Liotta and Animal scores with Kathy Griffin) keep this Muppet movie moving forward until it fizzles out in the last act with a huge, out-of-the-blue and wildly out-of-place production number, followed by the obligatory, overt Sunday school lesson about accepting people for who they are. This message itself isn't the problem -- kids movies trade on this stuff -- but "Muppets From Space" was having so much fun up to this point, the filmmakers just plum forgot to include it, so the Golden Rule stuff is driven home bluntly and quickly after the movie has run out of steam.